I have been touring local assisted-living centers and nursing homes. I will detail what I find in a future post(s?) to let you know. I can tell you a couple of things: there are a wide range of options, and there are a wide range of costs. I've been surprised by the costs, in fact, and I'm reviewing my mother's long-term care policy to figure out exactly what is covered and at what rate. The policy has two tiers of reimbursement so I have to sort that out. There is a difference between in-home aide, assisted living, assisted living with memory care, nursing home, and all the options in between. How they are categorized is going to have a big influence on what we eventually decide to do. There is also a veteran's benefit that we may be able to take advantage of since my father was in WWII. From what I understand, the actual veteran would receive about $1,300/month and the spouse around $950/month. That's huge when it comes to defraying these costs. It sounds like there is a maximum threshold for liquid assets that means we'd have to consult a tax attorney to figure out how best to accomplish this without Uncle Sam* getting more than he should. I'll let you know more about this as well. We're lucky that mother dear was smart with her money and there will be plenty for her needs if we do our homework and spend wisely. * For my international readers, I'm using Uncle Sam in this case as a term to describe the U.S. government, particularly the Internal Revenue Service (IRS) tax department. You may be familiar with him in the 1800s military recruiting "Uncle Sam Wants You" posters. 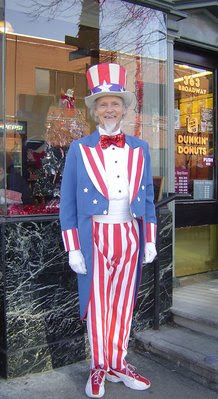 Uncle Sam, as it happens, hailed from the city where I live and you can see a character dressed up like him at a local street fair in this photo! You should be looking for an elder law attorney to help you with the veteran's benefits. I am just arriving to your blog and so I do not know much of your story. But if your Mom is potentially eligible for the aid and attendance pension, you should be looking to establish an irrevocable trust to deal with her non-exempt assets. Depending on her existing estate plan documents, you may need a court order to do that. Or at least that would be the way to proceed in Michigan. jerry--thanks for the advice. the woman at the last facility i visited gave me the contact of someone local that works for the government. he should be able to guide me through the process on that end as the web site is quite confusing since there are so many plans and programs. another friend mentioned the trust idea. my brother and i were considering putting the non-exempt assets into our names since it will all come to us anyway, but i think the money would be taxed twice...once on her when she pulls the money out, and once on us when we have to declare it as income. i had started a trust for her with a lawyer when i visited here about 5 years ago but my brother changed that plan after i left so i have no idea what the plan is now.